SafetyWing is a $37 monthly travel & medical insurance plan with impressive emergency medical and dental coverage, $3,000 of lost luggage coverage and a $250,000 maximum limit. In other words, it offers the best value of any travel and medical insurance plan on the planet. Sign up for SafetyWing today. The brainchild of three Norwegians living in Silicon Valley, SafetyWing is 2018’s answer to travel and medical insurance. In SafetyWing’s words, they’re building the “global safety net for online freelancers and entrepreneurs.” It’s the future of travel and medical insurance for frequent travelers and digital nomads alike. SafetyWing covers unexpected illnesses and injuries sustained abroad, including expenses for hospitals, doctors and prescription drugs. It also covers emergency travel-related benefits such as emergency medical evacuation, emergency dental treatment, travel delay/interruption and lost luggage. It even offers coverage in your home country, perfect for the frequent traveler who still likes to visit home once in a while. Americans have 15 days of home country coverage for every 90 days of their policy, while everyone else gets 30 days of home country coverage for every 90 days of their policy. SafetyWing’s policy excludes the same things as just about every other travel medical insurance policy: cancer treatment, pre-existing conditions (though it does include the acute onset of those pre-existing conditions) and routine check-ups. How Much Does SafetyWing Cost? Just like all insurance policies, the price of SafetyWing depends on your age. And as you can see, if you plan to spend any time in the USA, the price approximately doubles. Since SafetyWing is billed monthly, these prices are constant whether your policy lasts for one month or an entire year. How Is SafetyWing So Cheap? Just like N26, which is using seriously smart technology to shake up the world of banking, SafetyWing employs modern thinking to shake up insurance. No middlemen: SafetyWing cuts out the middlemen by eliminating agents and selling insurance directly to the consumer. A single policy: While most insurance companies offer dozens of different overlapping policies, SafetyWing only sells one policy, which allows them to streamline their back-end processes and offer that policy at a much lower cost. A focus on fairness: If even one customer bills their cancer treatments to SafetyWing at $10,000 a pop, that means every other customer has to pay for them through higher fees. SafetyWing avoids this cost asymmetry by excluding high-cost, highly specific items like cancer treatment from its policy entirely, while still providing coverage for the acute onset of pre-existing conditions. The healthy don’t need to overpay for the sick any longer. *SafetyWing’s policy has a maximum limit of $250,000, which means they won’t pay out more than $250,000 in any single coverage period. The items with no limit listed above are also subject to this $250,000 maximum limit. Most digital nomads and frequent travelers are familiar with World Nomads’ insurance plans. And if you’re really savvy, you know that N26 offers some pretty impressive insurance on their N26 Black and N26 Metal cards, too. *The SafetyWing and World Nomads prices are actually for a period of 28 days, though I’ll assume they’re monthly prices here for simplicity’s sake. **If a deductible amount is not listed, that means there is no deductible for that item. You probably notice an interesting trend in the above table: either SafetyWing or N26 is the best in every single item category. SafetyWing and N26 both have really impressive insurance offerings. Yet each of them leave you with a few gaps. That’s why I recommend getting both a SafetyWing insurance policy and an N26 Black or Metal card to ensure you’re more than covered in every scenario. Are you starting to see why I’m so excited about this combination? N26 Black + SafetyWing offers the ultimate low-cost insurance combination for digital nomads and frequent travelers. For just $48/month, you receive world-class coverage that has your back in every plausible scenario. Sign up for SafetyWing and N26 today. If you’re still not convinced on why combining SafetyWing and N26 is the best option for digital nomads and frequent travelers, let’s run through a few scenarios to see how each of these companies would respond. In each scenario, assume you’re a healthy 30-year-old traveler from New York. You’re hit by a car while crossing the street and need to see a dentist immediately. You touch down in a new country, grab $600 from the ATM and head downtown. It’s late, and your taxi drops you off a few streets from your hotel, but you don’t mind—it gives you a quick chance to explore the neighborhood. But before you know it, four men appear out of nowhere and knock you to the ground. You resist, but there are simply too many of them. Within a few seconds, they take off with your iPhone, wallet and MacBook. Your airline loses your checked baggage, which had your MacBook, iPad, DSLR camera, drone, and other valuable items inside. After several weeks of keeping you in limbo, the airline finally admits that your bag is irretrievably lost. *N26 reimburses a maximum of €400 ($455) in the case of lost luggage. The mailman slips on the icy sidewalk in front of your house, breaks his arm and decides to sue you. While backing your car out of the driveway, you bump into and kill the neighbor’s 100-year-old tree. You accidentally cause some damage to the lobby of the hotel where you’re staying in Paris. Let’s assume any of these three scenarios run up a bill of $10,000. Personal liability insurance is what protects you when you make a mistake, or simply when something goes wrong in an area you’re responsible for like your home. And as you can see in Scenario 4, having personal liability coverage can make a big, big difference. Personal liability insurance doesn’t normally come with travel or travel medical insurance packages, so the fact that SafetyWing has included it is a huge bonus. I dug deep into the policies of SafetyWing, World Nomads, N26 and other more traditional insurance providers, and there was only one real drawback I could find with SafetyWing: their weak travel delay insurance offering. Everything else—from their emergency medical coverage to trip interruption insurance to an extremely generous lost baggage policy—was actually really impressive. But here’s the thing: when you combine SafetyWing with N26, the weak travel delay insurance disappears. Why? Because N26’s travel delay coverage is really, really good. Up to €5,000 ($5,700) for a canceled or interrupted trip, and up to €400 ($450) if your travels are delayed by more than 4 hours. Aside from that, there are only two other smaller things: lost/stolen items and the adventure sports they’ve chosen to exclude. To ensure I had all of the details 100% correct, I spoke with SafetyWing’s core team in writing this review, and they told me that in Q1 of 2019, they’ll be launching a new, more advanced insurance offering that covers things like theft and the rest of the adventure sports they currently exclude. This new plan will cost a bit more than their current $37/month plan, but it will also have a maximum coverage limit of $1 million (compared to $250,000 currently), an extra bit of peace of mind for the concerned traveler. These are just further reasons to combine SafetyWing with your N26 card. As you saw in Scenario 2 above, the N26 policy took the best care of its users after they were mugged. Non-USA: You can definitely still be American as long as most of your travels in a given year take place outside of the United States. Non-Gear Junkies: You don’t travel with lots of expensive equipment. By expensive equipment, I don’t mean a MacBook, an iPhone and some Bose noise-cancelling headphones—these are exactly the type of people SafetyWing is built for. I’m talking about top-of-the-line photography equipment, professional-grade drones and other electronics worth $5,000 or more per piece. Non-Thrill Seekers: Again, I’m not talking about things like surfing and rock climbing here—those are all covered by SafetyWing. I’m talking about serious thrill seekers, people that are heli-skiing, base jumping and piloting their own hot air balloons. See page 19 of SafetyWing’s policy for a full list of sports and activities they don’t cover (if you don’t consider yourself a true thrill seeker, you probably don’t need to read the list). SafetyWing has made finding an insured provider as easy as typing in your location on their website. When you arrive, show the doctor or nurse your SafetyWing ID (it’s a digital card in your online profile). Sometimes, though not always, they’ll send your bill directly to SafetyWing and its insurance providers. Once you submit your Claimant’s Statement to explain what happened, you’re all set. Since I’m in Bangkok as I write this (yes, I’m a digital nomad myself), I did a quick search on SafetyWing.com to see what providers are available in Bangkok. There are fourteen providers in total, including Bumrungrad International, which is regularly named one of the top ten hospitals in the world on both service quality and technology. Then I searched for Toronto, my hometown, to see what’s available there. As expected, all of the major hospitals—Mount Sinai, Princess Margaret, St. Joseph’s, Toronto General, and even Sick Kids—are all there. The award-winning Bochner Eye Institute, recognized as one of Canada’s top eye care facilities, is also on the list. Go to the SafetyWing website here and click Sign me up in the top-right. You don’t need any promo/coupon code or invitation code to get the $37/month plan – everyone has access to that. Click Register, and then sign up using your email address or Facebook account. Enter the basic personal information (name, country of residence) and you’re all set! You’ve successfully signed up for SafetyWing. Canceling your SafetyWing subscription is as easy as canceling your Spotify subscription: simply login to their website and click Cancel. If you cancel your subscription partway through the month, it will remain active until the end of the month that you’ve already paid for. How Do You File An Emergency Claim With SafetyWing? Dial the phone number for your local representative as shown in this list here (I recommend saving this file and keeping it in an easy-to-find place while you’re traveling). If you can’t reach your local representative, call their global office at +1-317-262-2132. When asked for your account code, dial 911411#. The agent that picks up will instruct you on how to proceed. All claims must be filed within 60 days of when the insurance period ends. Where Can You Travel With SafetyWing Insurance? SafetyWing is valid in every country worldwide except for North Korea and Iran. Do I Qualify For SafetyWing? Why Should You Trust SafetyWing? Is SafetyWing A Scam? 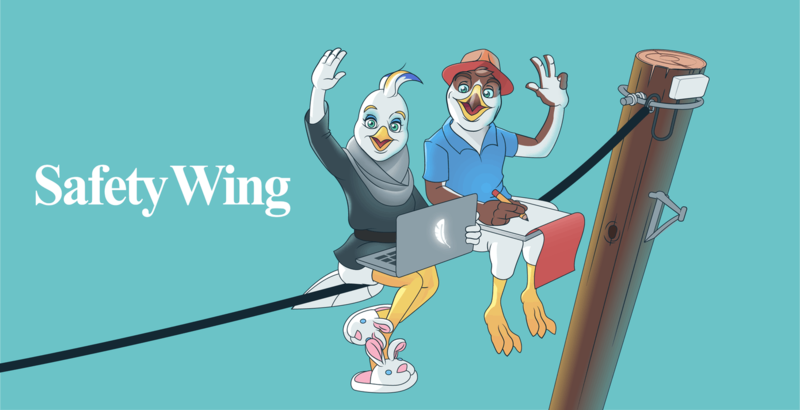 SafetyWing took part in the Winter 2018 cohort of Y Combinator, the Silicon Valley-based startup accelerator that’s known to be the best in the world. That means they’re joining the likes of Airbnb, Dropbox and Reddit as Y Combinator graduate companies. On top of the Y Combinator blessing, SafetyWing has also raised about $500,000 from investors like NordicVest Angels, the Norwegian Investment Authority and other individual investors. Their founders do hail from Norway, after all. On the insurance side, SafetyWing has hired senior insurance experts with 30+ years of industry experience to set up their plans. They’ve partnered with the worldwide insurance giant Tokio Marine for all of their plans, which are underwritten by Lloyd’s. One of their founders (Hans Kjellby) is also a lawyer, which doesn’t hurt in this industry. What Should Americans Know About SafetyWing? SafetyWing Is Not More Expensive For Americans: Unlike many insurance providers—World Nomads being a perfect example—SafetyWing charges Americans exactly what they charge everyone else: $37/month. Americans Receive Less Home Country Coverage: Americans only receive 15 days of home country coverage for every 90 days of their policy, which is half of what citizens of every other country receive. This isn’t an issue if you’re like many nomads and only spend a few weeks at home each year. SafetyWing Is Not Eligible For The Affordable Care Act: It’s worth noting that SafetyWing does not qualify for available coverage under the Affordable Care Act, so if that’s your primary reason for signing up, you’ll have to look elsewhere. However, for anyone living and working in the United States but not holding a United States passport (ie. foreign workers from Mexico, Canada or anywhere else), SafetyWing might just be the most affordable healthcare option out there. SafetyWing Is 1/3 The Cost: SafetyWing costs one-third of World Nomads. Normally with a price difference like this, you’d expect to see some serious deficiencies in SafetyWing’s coverage, but there actually aren’t. I’ve already explained what I believe is SafetyWing’s one major deficiency, but all things considered, it offers an even better policy for a third of the cost of World Nomads. SafetyWing Gives You More Flexibility: SafetyWing uses a monthly subscription model (ie. you pay per month and can cancel whenever you want, just like Spotify) while World Nomads, and just about every other insurance provider out there, requires you to take out a policy of predetermined length. Insurance companies love fixed policies, since they a) receive a large chunk of money from their customers upfront, and b) are generally nonrefundable if your 6-month trip ends after 3 months. SafetyWing throws all this out the window and opts for the simplicity and fairness of a monthly subscription.